Problem Management in the VI Service Desk - VIS, Inc.
To make certain that the same incidents do not continue to occur, it is vital to have a Problem Management process that properly diagnosis the root cause and implements a resolution. The resolutions from these problem tickets can be used to speed up the incident resolution time and identify permanent solutions, reducing the number of overall incidents. This results in less downtime and less disruption to business critical systems. Reduction in cost/effort of fire-fighting or resolving repeat incidents. 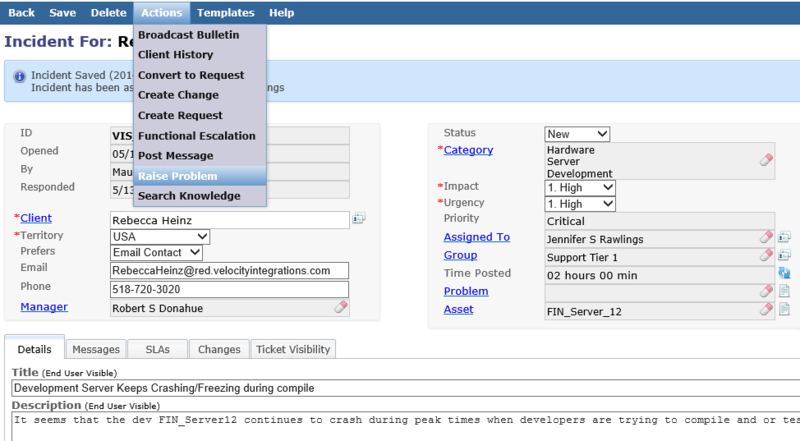 Problem tickets can be created from an incident by selecting 'Raise Problem' from the incident action menu (or from the navigator to initiate a new problem ticket without any associated incidents). Problem tickets created from incidents are initiated with all pertinent information from the incident. Ensure consistent prioritization by selecting Impact and Urgency to calculate the priority level. Assign the proper analysts ownership of the problem ticket. If warranted, the problem can easily be escalated to a more skilled group or individual. In addition, any other incidents associated with the problem may be added to the problem ticket. Document a problem as a Known Error in the Knowledge Base by creating a Known Error record and linking it with the problem ticket for reference. Associate specific hardware such as a server, printer, or router that is affected by the problem. Importing useful email information is simple and helpful in properly documenting a Problem. This can be of great use during an audit and also when needing to review past problems. All work performed and time spent on resolving a problem can be easily logged within the problem ticket. Having a well documented Work History is extremely useful when reviewing past problems, tracking progress, and providing a time line during audits. The closure process notifies all users on related incidents when a problem has been resolved, giving each user an opportunity to approve or reject their respective incident within a configurable time frame.